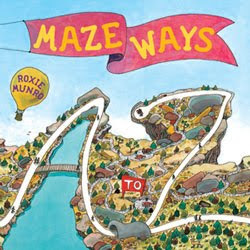 We read some exciting, interactive, and a-MAZE-ing books this week by author Roxie Munro. Her search & find maze books kept my daughter and I plenty occupied for several hours and have been, by far, her favorite choice this week from the bookshelves. My toddler son also enjoyed browsing the collections of mazes and trying to find various animals and objects hidden in the pages, at least for a short while. 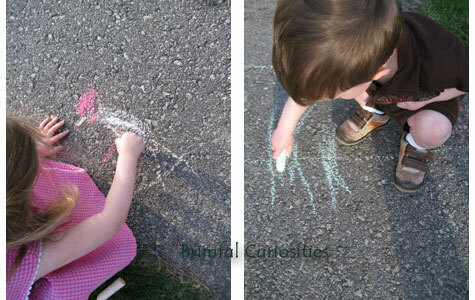 We were so inspired by the books that we made our own full size maze in our driveway using sidewalk chalk! Munroe's mazes for each letter of the alphabet are highly detailed and visually interesting. Each maze takes the reader to a different location -- from an Airport or Garden to a Ranch or Waterfalls. The author provides directions on how to navigate through each letter maze. My daughter used her finger to follow the paths and enjoyed completing the tasks described. For instance, the letter L maze directions reads: "Enter through the LIBRARY door. Find the red Italian language book hidden on a shelf. Look up flights to Rome on the computer..." Several objects are also hidden in the pictures for children to find. The end pages give the correct solutions. This book would be perfect to use in conjunction with teaching the letters of the alphabet and older kids will enjoy trying to complete the maze puzzles on their own. Besides navigating the mazes, it's also fun to trace the large maze letters with your finger and use it like a tracer page for writing practice. What's it like where you live? In EcoMazes kids can explore many different places on the earth by following the nature mazes and learn about the different types of creatures and plants living there. The book features twelve ecosystem maze puzzles: Tropical Rainforest, Desert, Coral Reef, Alpine High Mountain, Arctic Polar, Wetlands, Tundra, Grasslands, Antarctic Polar, Savanna, Conifer Forest and Temperate Forest. The mazes vary in difficulty and younger kids will probably need a little help in solving puzzles. (We hit a rock trying to hike through the Alpine High Mountain and had to refer to the solution at the end of the book.) Along the way, kids can spot several animals native to each different environment -- Munro included over 350 different species. My daughter's favorite, the coral reef, shows divers swimming and trying to find their way back to the beach through clear blue water filled with seahorses, stingrays and other marine life. The detail in this book is incredible! I wonder how long it takes to illustrate just one of the mazes? The content provides a wonderful springboard for learning more about ecosystems and the animals that live there. Perfect choice for Earth Day and would work well as an entertaining supplement to environmental/ecological lessons and studies. This week we tackled our biggest stART (story+art) project ever! After some research, we learned that our area is a mixture of Midwest oak savanna and tallgrass prairie. We decided to learn more about the ecosystem we live in by making our own large scale maze outdoors. We choose to create our own Midwest Oak Savanna maze. First, we laid out a small scale maze on a piece of paper. 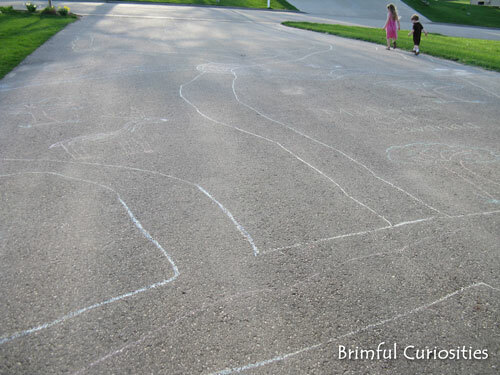 Guided by the sketch, I used sidewalk chalk to draw out the entire maze on our driveway. The kids helped fill in the maze by drawing grass, coloring in the water and by helping draw some of the animals. Our ecosystem includes oak trees, tall grass, rocks, a stream, white-tailed deer, rabbits, snakes, turkeys, and a Red-headed woodpecker. We also choose to include a campground to illustrate how the animals and people live together in the same environment. The kids loved learning about the animals that live in our region and liked exploring the people-sized maze. They even decided to try navigating the maze by bike and push car! 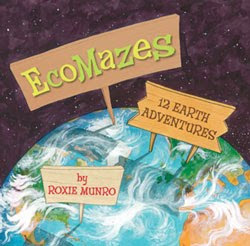 Sterling Children's Books has graciously offered to giveaway a copy of EcoMazes:12 Earth Adventures to a Brimful Curiosities reader. I'm a follower through Google Friend Connect. How fun! 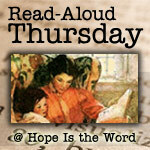 I love all the great activities you were able to incorporate with just the couple of books. They're perfect for the outdoor weather coming up the next few months as well. Thanks to Sterling for the giveaway opportunity! I'm a follower via RSS and Google Friend. They look like great books. The project looks like it kept them busy for a good while! This looks like a great book and what an amazing project to go along with it! Very interesting looking book. A lot of projects and great information. This sounds fantastic! I'd love to win a copy! Those books look great! I haven't heard of either of them, although we do have some maze workbooks for E that she loves. This books look great! I love the chalk mazes. I love the idea of doing a maze on the driveway. My kids would love that! Sounds like a very interesting book. I wouldn't mind taking a look at it. Love this book, and how cool is it that you get to give one away! And, I'm a big fan of mazes. This book sounds wonderful and very educational. Please enter me into this giveaway. I really love mazes and would love to work on them with my grandson. I've yet to try any real mazes with my kids - but later in the year I hope to visit some and go exploring! Mazes are fun! My daughter would love this! It's great that the mazes take you different places. One of my nephew's is down right sharp with mazes. Such a fun book! My boys would love this. Thanks for the giveaway. My preschooler is a HUGE maze fan, so this looks like something he would really enjoy! I am interested in all books and this one looks different which I like! 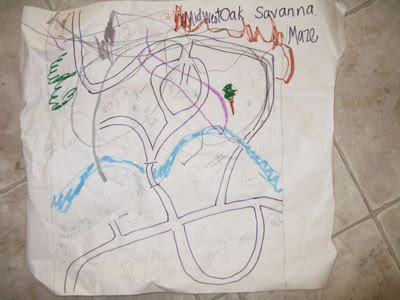 I like the maze you made and teaching the kids about the ecosystem you live in is important. Creating your own mazes to go along with the books sounds like so much fun! My son has been obsessed with mazes lately, and I'd love to share the book with him! We loved her earlier books! Just subscribed, curious to read more from you! My kids love mazes. These books look like so much fun and educational too. I think they would enjoy the tropical rainforest and wetlands sections the most. I love the green-educational aspect of this book! I'm a email subscriber thanks. We like doing puzzles and mazes. Please include me thanks. I want this for myself! No need to enter me, though (I really ought to act my age, right?). I'm dropping in to say thanks for the e-mail. I've got this posted at Win a Book for you. This one sounds great. I'd love to be entered. Thanks. This looks like it would be great to share with my daughter! Would love this book for my son! Thanks! My son is just starting to get into puzzles and mazes. This would be such a fun book for us to read together! I am an adult and I still find mazes fun! My kids love search and finds. I think that working puzzles, and completing mazes as a kid makes for smarter adults. My girls would love this book! They are SOOO into doing the environmentally right thing! So this is the perfect combination of fun and learning!! I forgot to leave my email address in the previous post. I learned that the book was published last month. What a cute book! My daughter would love it!